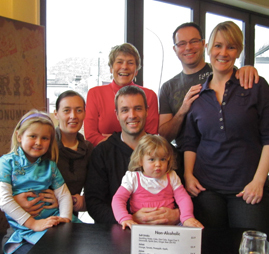 Catherine's Creations About Us -The McLachlan family from New Zealand. Catherine's Creations has been making badges for over 25 years! It all started when Catherine was accepted as an exchange student to the USA. 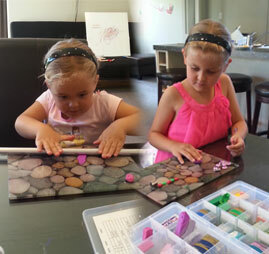 Trying to raise some spending money, Catherine started making her creations with Helen (Mum) helping to sell them. When Catherine headed overseas in 1991 it was up to Helen to keep the business going. Girls creating Now the business is mail order only, for fifteen years Helen ran a stall at the Christchurch Arts Centre Market. Throughout this time the Catherine's Creations range included a variety of products such as earrings, brooches and buttons before settling on name badges only. Catherine's Creations become a family business with Donna (daughter in law) working part time looking after all the orders, accounts and website so Helen can spend all day playing with her fimo, creating all the badges. And Catherine moved to Sydney, Australia in 1999 where she remains today but still makes the odd badge now and then.